Freelancer.com | Far from Workable for Finding Statistical Expertise! So here's a theory: with so many skills available, how about finding expertise online? This is one of the ideas behind Freelancer.com, and we tried it out. 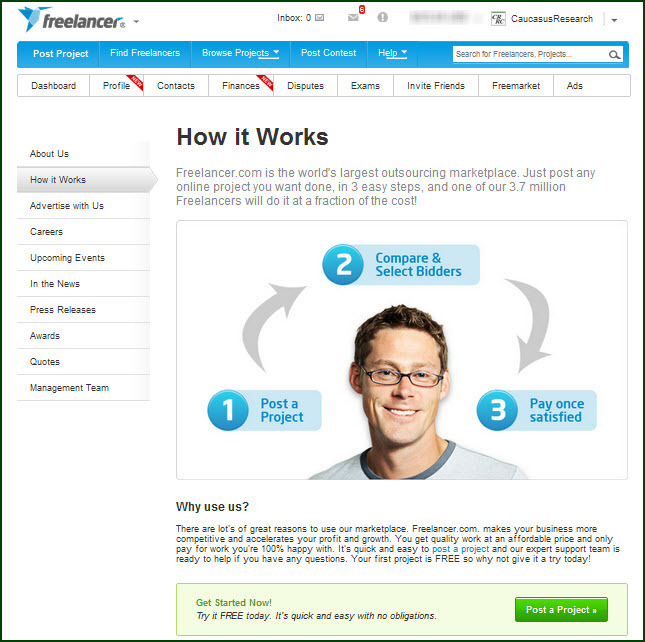 Freelancer.com certainly advertises themselves in a big way: supposedly the largest outsourcing platform worldwide, with more than 1 million projects completed, connecting more than 3 million freelancers and employers. We had some data analysis that we wanted to farm out, and the hope was that the right people might be anywhere, after all why not match an experienced survey statistician in, say, Uganda with CRRC in the Caucasus? It seems like an exciting possibility. So does Freelancer.com work for statistical expertise? Unfortunately, Freelancer.com runs far below expectations. (This is a polite way of saying that the system is dysfunctional for anyone with advanced needs.) The website is clunky, hard to maneuver, stitched together on the fly, probably useful for the most basic transactions, but not for more sophisticated transactions. It's also dreadfully slow. As for the quality of the bids on Freelancer.com, we received two good ones, among the 23 bids. But the majority are people who plainly shouldn't be bidding, since they have no clue what they're writing about. This creates extra work, as you sort through things. Unfortunately the system for evaluating these bids is not good – remarks that you enter disappear, and while there is all sorts of supposed snazzyness to the left and the right on your screen, it really seems as if no one has done any usability tests. You run around in circles. If Freelancer had intended to set up a system to make it deliberately difficult to choose, they would have done a splendid job. Freelancer.com does have support, but it doesn't work for you. Several times I received no response. When persisting (because I wanted access to deliverables I had set), I was told to wait "around 2 minutes", and more than 15 min. later I still hadn't heard back (see below). I then was instructed to read their FAQs on issues even though clearly the website didn't work. 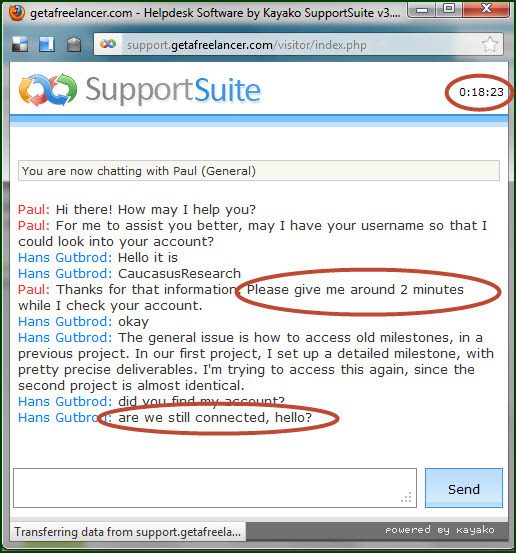 50 minutes later I was still online with support giving me intermittent attention, still trying to find a fix for a very basic problem. 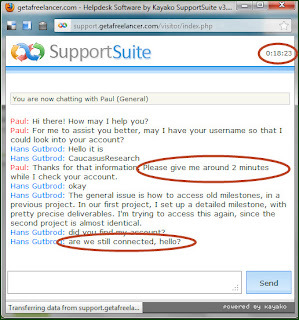 And in the end, when they couldn't fix the problem – they just threw me out of their support line and terminated the conversation. Overall, a deeply frustrating process with Freelancer.com, taking me hours of time. They also have a hefty fee structure, so that even projects that don't succeed end up costing you quite a bit -- may be worth thinking about, and they mentioned they have 3 million employers and freelancers signed up, but less than half of that as completed projects. If there isn't a better way of finding statistical expertise, the market in the foreseeable future will remain local, and running through personal connections and networks. If anyone knows of a better system of finding statistical experts out there, please let us know.